By Representative Al Gentry – At the end of the 2018 legislative session, two bills were rushed through in one day. One was the much-publicized pension bill (SB151) that was recently ruled unconstitutional. The other was a tax bill, which passed as HB366, was vetoed by Gov. Bevin, overridden to become law, then quietly replaced on the last day by a more expansive tax bill in HB487 using the same one-day lawmaking process. HB487 became law only after the Governor refused to veto or sign it and went into effect on July 1. Did you follow that? Welcome to the new Kentucky State Legislature! If you think the Pension law was correctly ruled unconstitutional, then it’s easy to surmise that HB487 deserves the same fate. But this article isn’t meant to debate that, but rather to provide three “additional” reasons HB487 is a bad law. Moving toward a more consumptive-base tax structure can be a broad-based approach in which revenues grow proportionally with economic growth. However, that asset disappears when the tax is selectively applied. Taxing only certain services while exempting others is selective. Many retired teachers exhaled when their COLA reductions were removed in the final pension bill but are now upset to learn their pensions received a $500/yr tax increase. Sole proprietors and small non-profit charities operating on shoestring budgets are now burdened with tracking new tax activity as they’re forced to charge their valued customers more. What’s a fair tax is debatable, but shifting from a progressive income tax structure, based on amount earned, to a flat 5% rate raises taxes on the lowest earners, while giving cuts to the highest. That is not debatable. The nearly $900 million in new taxes will only net the state about $180 million per year because the rest is being given back in tax cuts and credits. The Institute on Taxation and Economic Policy reports that the top 5% of earners will receive net tax cuts, while the other 95% will pay for them in net tax increases. Of that $180 million of new “net” revenue, roughly $120 million comes from the new $.50 per pack cigarette tax. However, smoking has been declining for years. Teen smoking is at historic lows, which is good for society, but bad for a new tax policy that relies heavily on a regressive source as 2/3 of its new net revenue base. Businesses across our state are angry about a Combined Reporting mandate, claiming it will hinder economic growth. Passing three bills I co-sponsored with other Democrats and Republicans (HB 229 –Casino Gaming, HB166 – Medicinal Cannabis and HB432 – Tax Credit Review Board) would’ve been a more logical approach. Doing so generates revenue from two new industries, brings new jobs, and produces considerable savings through a higher-performing tax credit program. New annual revenues could grow by $1 billion, but majority leadership chose not to advance any of these bi-partisan bills. Moral opposition of casinos exists, but gaming is already here in principle. Kentuckians who play card or dice games already do so in Indiana, Ohio, Illinois, Missouri and West Virginia. Gambling addiction problems already exist as well, but we lack the tax revenues that could help those afflicted and help fund our pension liabilities. Medical cannabis programs are legal in 60% of our states. The trend is obviously toward legalization. Economically, we hear about the revenues generated in those states, but rarely read about the export potential of cannabis in Kentucky if federal barriers were removed to allow interstate commerce. Our climate, geography, and access to water provide us with unique advantages over others. Introducing the industry now positions us to fully capitalize on this future emerging market. A Review Board of Legislators and Economic Development Cabinet leaders to oversee our corporate tax credit programs can provide accountability and efficiency with no additional cost to the state. We can debate whether HB487 was passed illegally, but regardless of its constitutionality, most voters I’ve talked to agree it is bad policy, and needs addressing in January, if not challenged beforehand. State Representative Al Gentry is a small business owner and national non-profit sports consultant for people with disabilities. 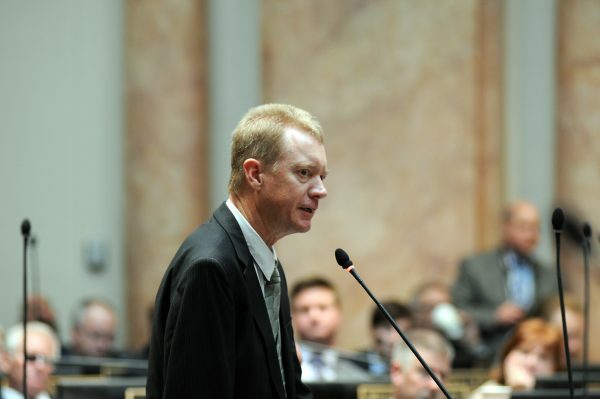 He represents the 46th District in south Louisville including Highview, Okolona, Rangeland and western Fern Creek.